A blend of soy sauce, shiitake extract and yeast extract spray dried on modified food starch carrier. This vegetarian blend is designed to provide umami in a wide array of products. 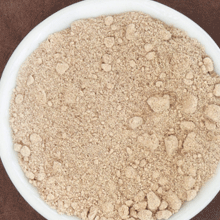 Modified Food Starch, Soy Sauce (Soybeans, Wheat and Salt), Shiitake Extract (Shiitake Mushroom and Maltodextrin), Yeast Extract (Yeast Extract and Salt).